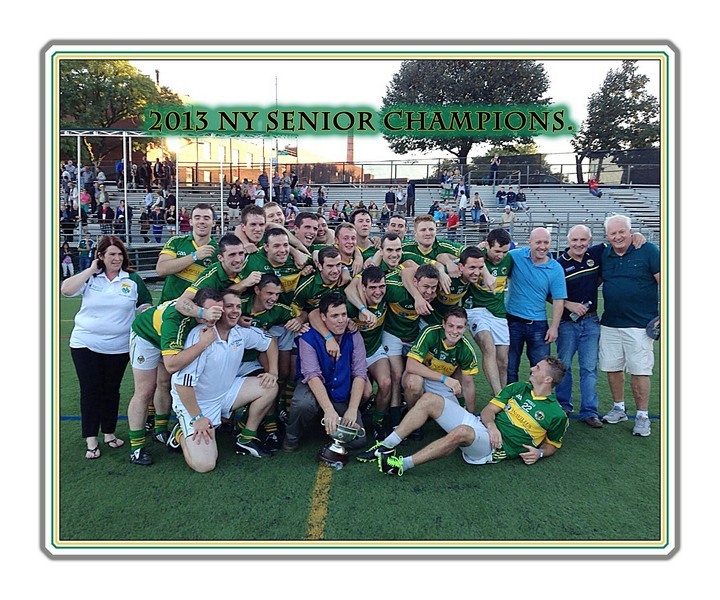 Kerry won their 26th New York senior football title on Sunday with a determined victory over three in a row champions Leitrim. In a battle that resulted in four players getting red cards the numbers game went to the winners as Paddy Kelly was their lone conspirator. With time running down, the numerical advantage was far too much to overcome for the outgoing champions. The game was physical from the get go with no quarter asked or given. Kelly was the receiver of numerous heavy tackles but his performance was lifting as he began to dominate the middle. When a major skirmish occurred in the eighth minute of the second half, both he and Rory Woods were sent to an early bath. The Leitrim loss was far more as a number of frees were missed -- frees that Woods was popping over this year in the routine. Kerry did react positively to the heavy going and their fitness advantage was huge. After going into the break in a one point lead, 1-2 to 0-6, they dominated the opening 10 of the second half where they extended their advantage to 0-10 to 1-2. Leitrim had their best period following the removals but with 10 minutes left, Adrian O'Connor received a red for striking out after ironically Leitrim had cleared the danger from a Kerry attack. That was a bridge too far. The third sending off, Aiden Power when he was less than five minutes on the field, had little bearing as now Kerry were driving home. Kerry opened the game with points from Mike Fitzgerald and Paul O'Donoghue in the first eight minutes, and they were already starting to exert control. Against the run of play and after a defensive slip, Gavin McPartland found the net to put Leitrim on the board for the first time. Keith Quinn did have the equalizer immediately after, but then Leitrim caught a break. Kerry had the ball moving out of the defensive end, but an altercation between Kelly and Brendan Quigley was deemed enough to stop the play and book both. Kerry now lost possession as the ref threw the ball up. Leitrim won that and quickly Woods fired the football over the lathe for the lead, amazingly for the last time. Kerry reacted positively with two points from O'Donoghue, the first a brilliant sideline kick, the second a free from an easier position. After a Ciaran Hughes score when he joined the attack, Kerry went on the offensive. O'Donoghue, who was now causing untold problems, hit the upright before a wide by Mike Nester was followed by Quinn's second point. As time to the half ticked down, Damien O'Connor joined the attack. While he could have got closer to goal his brilliant shot got past Pa Ryan but thundered back of the post. Adrian O'Connor received a yellow for a foul on Kelly before the break in an ominous sign for later. O'Donoghue again all hit the target. But for Pa Ryan in the Leitrim goal it would have been much worse. He stopped a Quinn shot four minutes in and the last point was headed for goal but for the acrobatic save the keeper made to push it over. Leitrim had a free eight minutes in on one of their few attacks, but retaliation resulted in a throw up. On the ensuing shuffle and donnybrook Woods and Kelly were gone, with McPartland firing over the second chance free. Two further points followed in the best period for Leitrim. Jer Sullivan made an excellent save to stop it getting worse before normality returned and Kerry attacked again. A Moran chance at goal was turned away by Ryan and another chance was also repelled by the defense. On this occasion, however, Adrian O'Connor struck a Kerry player in the aftermath in full view of umpires and ref and his day was done. The numbers game was too much for Leitrim to contend with and their fitness was proving critical. They had two points from Fitzgerald and O'Donoghue to cancel out a second Hughes effort before a normal looking sideline on the stand side created trouble. A Leitrim kick was lost due to retaliation and a throw up resulted. Common theme. Kerry won the ball and moved forward before Power and Sean Kelly got tangled. When the dust cleared Power had a red, Kelly a yellow with at least one other Leitrim player very fortunate to stay on the field. Easily stopping any further Leitrim attacks, Kerry added two points to their total before McPartland had the final score. The final whistle sounded to jubilant scenes for Kerry. It was a total team effort for the winners. The sum of the parts was too much to handle, although Paul O'Donoghue and Keith Quinn were outstanding over the hour both as ball carriers and scorers in chief. Jer Sullivan varied his kickouts to good effect; hard to do with Brendan Quigley in the middle. His save was timely. Kieran O'Connor did a lot of hard work at the back, including blocking a couple of close range shots. Kieran Scannell was excellent also against his old side. Damien O'Connor was tremendous in the middle with Mike Nester also dropping into a defensive role for long periods. John Curran cancelled out Paul McComiskey brilliantly and despite taking a heavy knock early recovered. Mike Jim Fitzgerald and Paddy Kelly were outstanding in their own ways. Kelly got hit harder than anyone in the early going and was getting stronger as the game went on; he was also the receiver of a knock early on. Gary O'Driscoll had the most effective game despite not scoring. He burned his marker continually and was fouled for the free on four occasions. Leitrim will head back to the drawing board. Pa Ryan was a close second in the man of the match accolades. His saves were pivotal in keeping the game as a contest. Mike Creegan battled to the end. Kevin Meaney started brightly while Quigley had a number of breathtaking catches in the middle. Other than Gavin McPartland, however, the forward line never got going, and after Rory Woods went to the line their best chances were gone. Kerry: Jer O'Sullivan, 2 Kieran Scannell, Tralee, 3 Kieran O'Connor, Listowel Emmets 4 James Huvane, 5 Sean Kelly, Blennerville, 6 Damien O'Connor, 7 John Curran, Dromid, 8 Mike Fitzgerald (0-2), Lispole, 9 Paddy Kelly, Ballylongford 10 Niall Farrell, 11 Gary O'Driscoll, Skellig Rangers, 12 Keith Quinn (0-4), 13 Mike Nester, 14 Robbie Moran (0-1), 15 Paul O'Donoghue (0-7). Subs: Ronan McLoughlin, Daryl O'Brien.